Galco 1880's Cartridge Belt FREE SHIPPING! 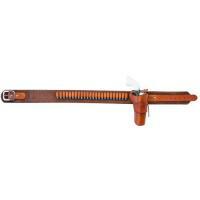 The Galco 1880s cartridge belt is a hard-working rig designed for single action shooters. It resembles the belts worn in American Westerns, perfect for Cowboy Action Shooting and shooters for want a classic design. It is made from premium center cut rough-out steerhide, making it highly durable and allowing it to break in over time for superior comfort. The billets and cartridge loops are also made of premium steerhide, while the sturdy single-bar buckle is nickel-plated brass. The loops are centered on the belt, allowing left and right-handed shooters to use it effectively. ©2002-2019 CopsPlus.com: Galco 1880's Cartridge Belt FREE SHIPPING!